I came up with a genius idea the other day, well at least to me I thought it was genius. 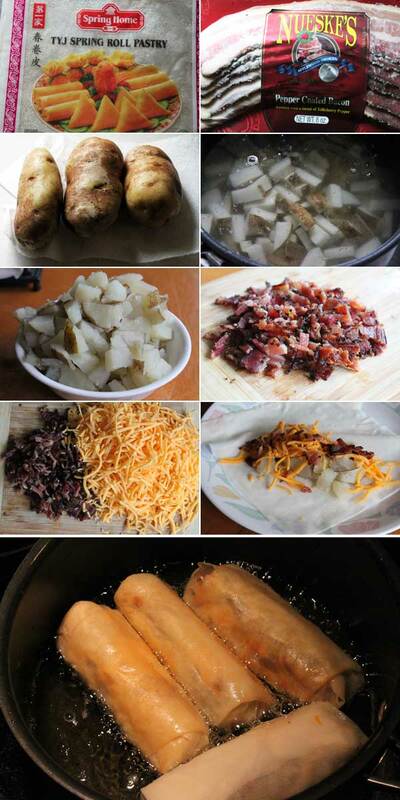 There were a couple of things that steered me this to making this awesome batch of egg rolls; one being I was totally in the mood for egg rolls, and the other is that I had a package of Nueske’s bacon calling my name as I was looking at some potatoes I needed to use up on the counter. It’s funny how that works, but it’s also funny how flipping amazing these were. As my wife and kids were running errands this past weekend, I decided to make a batch of these and see if there were any takers when they returned. Let’s just say there were takers, and I had wished I had made double the egg rolls. These made 6 egg rolls, so increase everything if you are needing more. I highly recommend more. Start by having everything prepared. When you are ready to build your egg rolls, heat your oil in a sauce pan, large enough to fit a few egg rolls, to medium heat. You will want the oil to come up to around 350 degrees. During this time, make the egg rolls. I used two sheets of egg roll wrappers per egg roll. Why, I have no idea, but they worked out. I think I had a fear that the potatoes were still a bit wet after I drained them and I thought they may tear or open in the oil. Regardless, feel it out and use 1 or 2 should you desire. If you are not familiar with how to roll an egg roll, refer to the following instructions. Take about a quarter cup of the potatoes, and lay them along the middle. 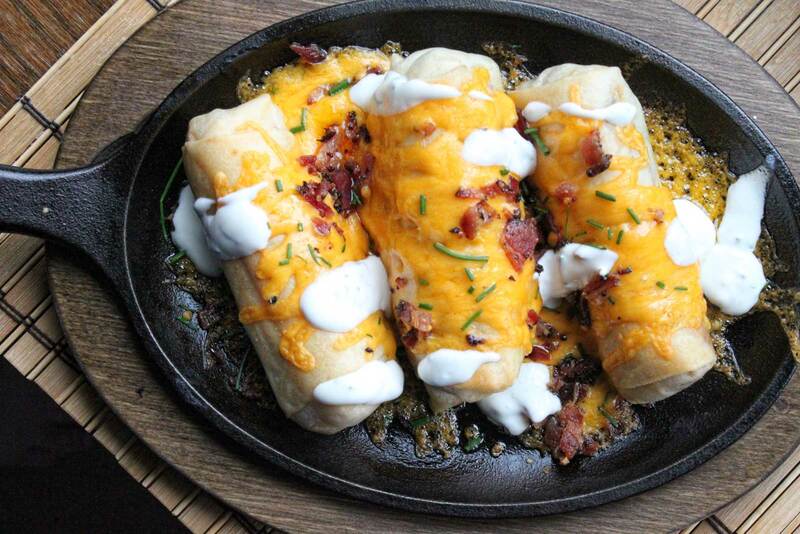 Top with a bit of cheese and bacon crumbles, fold over the sides, and continue to roll. When you have a bit of the point left, brush on some of the egg wash, and finish to seal. If you are using a second wrapper, lay the egg roll on top, and fold, and seal. Repeat with the remaining egg rolls. Once the oil is ready, carefully add a few egg rolls at a time, and cook, turning carefully until the wrappers are a nice, golden brown. Remove and place them on a paper towel lined plate. Repeat with the remaining egg rolls. These are ready to eat as is, but I took mine and placed them on a fajita skillet, covered with a bit more cheese, and bacon, and placed them in the oven until the cheese was melted. Drizzle with sour cream and chives, and get to it. I’ll be honest, I took down two of these, and when my wife and kids came home, not only were they excited by the idea (they love egg rolls), they tore into them like it was nobody’s business. My kid even requested to warm one up the following morning for breakfast. 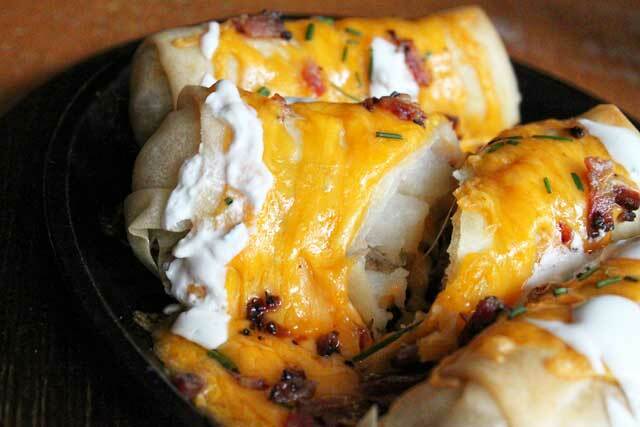 So if you love loaded potato skins, you are going to loved these loaded baked potato egg rolls! Hope you enjoy.